Regime forces launched an offensive on the governorate of Aleppo in late June 2016, a bloody battle aimed at cutting the rebels’ supply and that is still raging at the time of writing. The prize of the Aleppo attack would be a strategic supply route but also the symbol of seizing what used to be the home of 6 million Syrians and the country’s main economic hub. The loss of the battle is also hefty: For the rebels, losing Aleppo means losing one of their strongholds but also means that their other stronghold Idlib is next on the regime’s attack list. For the regime, losing Aleppo would be a hard blow for the army’s moral and would dim their hope of gaining control of the northern part of Syria. The strain of the war on the regime, the rebels and the population is getting ever-more strenuous. The government, in dire need of revenues, lifted energy prices on June 16th: the price of one liter of petrol was upped from 160 SYP to 225 SYP, the price of a 10 Kg bottle of cooking gas was raised from 1,800 SYP to 2,500 SYP and the price of one liter of Mazout was increased from 135 SYP to 180 SYP. The new pricing sparked a heavy reaction from the population which later compelled the government on the 19th of June to increase the monthly salaries of public and private sector employees by 7,500 SYP. Individuals exercising liberal professions, working in the field of agriculture, students, merchants and the unemployed will not benefit from the salary increase. In the first half of 2016, the external trade activity saw an improvement when compared to 2015. The revenues at the Port of Tartous totaled 4.25 billion SYP compared to 1.85 billion SYP in the same period last year. The same goes for the Port of Lattakia, where the revenues amounted to 10.5 billion SYP, up by 7 billion SYP from the comparable period in 2015. The authorities have been very active in the legislation regarding foreign trade activities; the Ministry of Economy and Trade recently freed importers from a 50% deposit in Syrian Pounds in relation to imported items such as baby’s milk, fertilizers, agricultural seeds and matte and the financing of these imports will be borne by the Syrian Central Bank. For a certain category of imported goods on which customs duties are 20% and 30%, the deposit requirement was scaled back from 100% to 25%. According to the Syrian Central Bank, importers are allowed to use 25% of the deposited amount to finance only imports that are subject to customs of 1% or 5%. The Central Bank of Syria has also given the importers who have already received their import license or approval a one month deadline to file their applications to buy foreign currencies after which the bank is no longer responsible for their foreign currency funding and the importers’ deposited money is returned to them. This decision went into effect as of the first of August 2016. 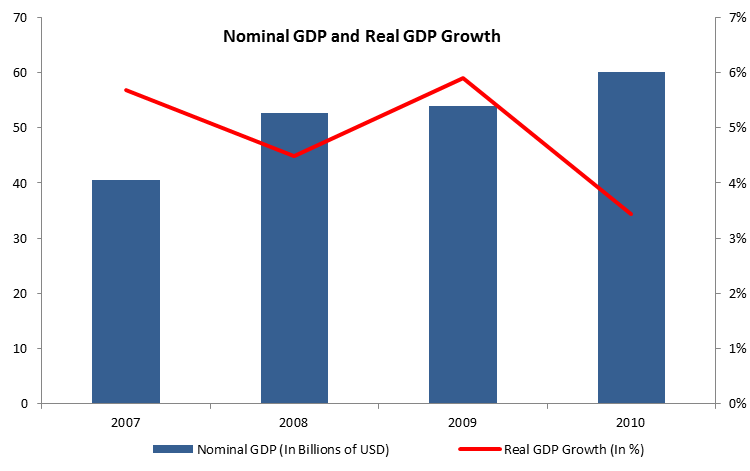 Regulation was not only centered on imports but also on exports. 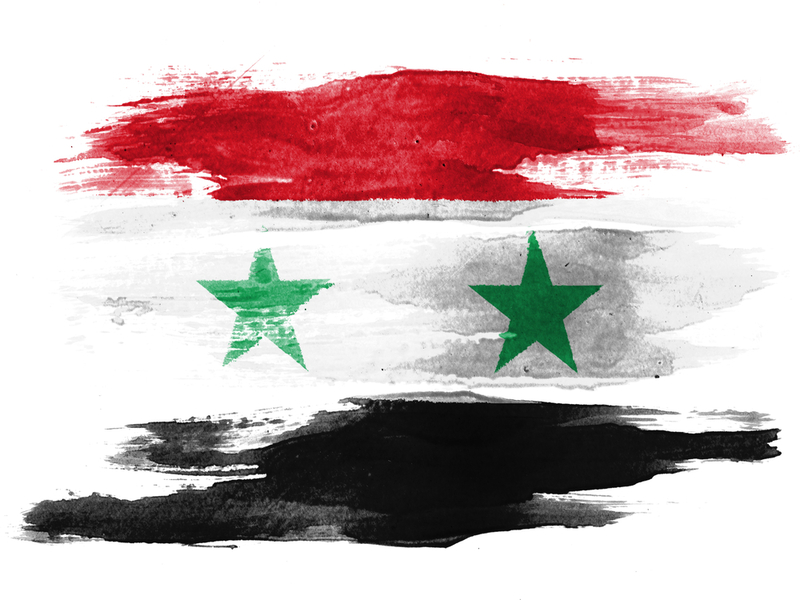 While the Syrian Central Bank previously compelled Syrian exporters to sell the entirety of their foreign exchange earnings, they are now are allowed to hold on to them until the beginning of September. The war has allowed for many cases of tax evasion, eating away revenues that the treasury desperately needs. The spending department at the Damascus Ministry of Finance recently stated that it regained 5 billion SYP of consumption tax dues since 31/06/2015 and another 5.5 billion SYP worth of tax evasion. Some of the re-collected amount dates back to 2012, pointing to the large extent of chaos and loopholes the war has inflicted on the economy. Dealing with international sanctions and defending the value of the Syrian Pound against the dollar have been great challenges for war-ridden Syria. The Syrian Central Bank has attempted to work around the sanctions and the erratic nature of foreign exchange operations by allowing licensed banks to deal with foreign currency transactions, whether the foreign currencies are for commercial or personal purposes, since publically-owned banks are tied by sanctions. According to decision 1409, the banks can now assume positions on the foreign markets on the condition that these positions represent a maximum of 1% of their core capital. The Council of Money and Credit at the Central Bank of Syria will activate the role of banks in FX financing by tapping into its operating reserves that are fueled by transfers from abroad and assets purchased from individuals, financial institutions and banks. 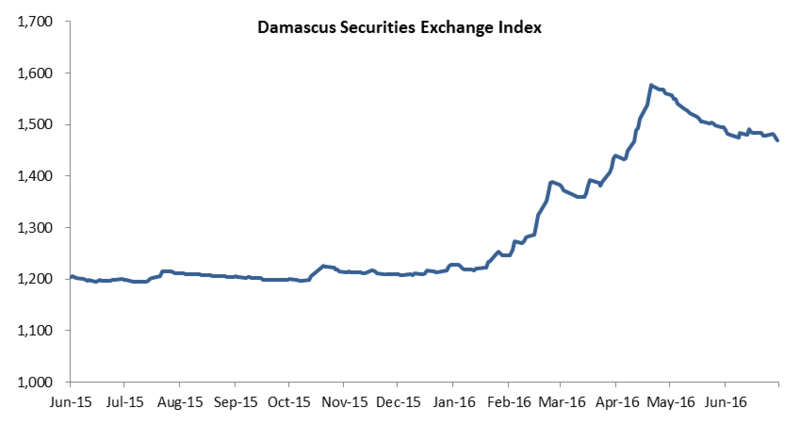 In the second quarter of 2016, the weighted index of Damascus Securities Exchange (DWX) reached 1,469, which registered a 22.41% year-on-year (y-o-y) increase, and a 2% rise when compared to the first quarter of the same year. Total traded volume and total traded value sharply increased in the second quarter of 2016 to reach 5.55B shares and SYP 1.03B ($4.80M), compared to 2.7B shares SYP 379.93M ($1.77M) in Q2 2015, respectively. As for the top performers for Q2 2016 , Ahliah for Vegetable oil ranked first with a 27.39% growth, followed by Al-Baraka Bank Syria, and Syria Gulf Bank with respective inclines of 23.01%, and 7.24%. On the contrary, the worst performers during the same period were Qatar National Bank, Ahliah for Transport, and United Insurance Company which recorded respective drops of 8.77%, 7.41%, and 7.12%. According to Bloomberg, the spot price of the dollar against the Syrian Pound went from 219.95 at the end of December 2015 to 216.85 at the end of June 2016.